With temperatures soaring and no rain in the immediate forecast, soils are drying out quickly in our area. It’s time to revisit your irrigation controller and see if you’ve got it set up to deliver the what your lawn and landscape needs. Follow these tips to water like a pro! First off, it is a good idea to reacquaint yourself with your city’s water guidelines for summer. Over the last few years, many cities have reduced their restrictions, but that doesn’t mean you water conservation isn’t an ongoing priority. The City of Plano, for instance, used to limit watering to only twice per month. Now, Plano residents can water twice per week. Visit your city’s official web page to familiarize yourself with any changes that have been announced. In most cities with water restrictions, supplemental hand-watering for new plants, container gardens and vegetable gardens are allowed at any time of day during the week. But again, check your city’s current water regulations. Soil health is #1. Without healthy soil, plants won’t thrive. Healthy soil full microbes, earthworms and other beneficial organisms will help improve soil texture that in turn helps to retain water, reduce runoff and help plant roots properly uptake nutrients. We apply humic acid, liquid compost extract, worm castings and other organic amendments to keep soil healthy. Timing is everything! If you are watering during the hottest part of the day, from 10am and 6pm, you could be wasting up to 30 percent of your water through evaporation. Plus, cities like Dallas prohibit watering during this time period. It’s best to water early in the morning, but after 6pm is acceptable in the hottest part of the summer, especially if you’re using drip irrigation. Water where it needs to go. Are your sidewalks and driveway constantly wet? Is water running from your lawn down the street? It could be that soil is not absorbing water properly, you have a break in a head or line, or there is too much pressure for the watering zone. Not only is watering the concrete wasteful, but it could also earn you a city citation. Save water with the cycle and soak method. Check your irrigation system annually. Only a licensed irrigation specialist can properly audit your system. They’ll ensure your system is set correctly, check for leaks and broken sprinkler heads, and look for ways your system can be more efficient. 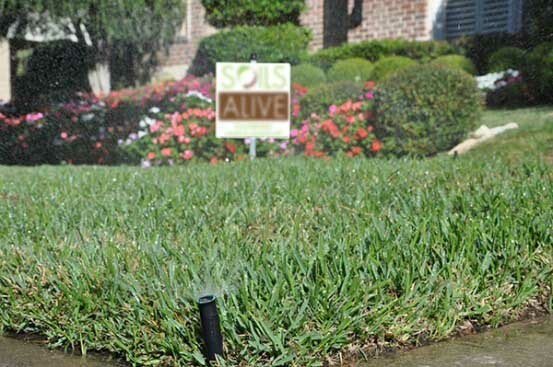 Remember, a properly working sprinkler system will save you money and water in the landscape. More on why you must check your irrigation set up yearly. Mulch. One of the easiest ways to save water in the summer landscape is by adding two to three inches of mulch to all garden beds and around the base of trees and shrubs. Mulch helps to retain moisture in the soil, suppresses weeds, regulates soil temperatures, gives the landscape a tidy appearance, and improves soil health as it decomposes back into the soil over time. Each season has its own method for watering just as plants have different water needs throughout the year. Questions about summer watering and how healing your soil could help you save water and money? Give us a call.